Rotary Club of East Sutherland - welcome! Please scroll/swipe down through this page to find out more about us, in addition to the pages linked in the menu, top-left. 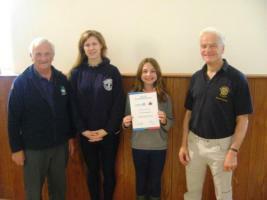 Recognition for Dornoch Academy Interact Club. Our members are particularly fortunate to live in one of the most beautiful parts of Scotland and we offer you a warm welcome to our web pages and true Highland Hospitality & Fellowship should you decide to visit us. 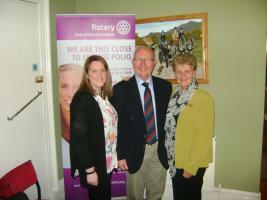 We are one of 88 Rotary Clubs in the north of Scotland and one of the over 3000 Rotary Clubs worldwide. A short video about Rotary International can be viewed HERE. Helmsdale and Golspie as important fishing ports. Golspie is also the location of Dunrobin Castle which attracts visitors from all parts of the world. Bonar Bridge not just for a stunning bridge but also for excellent salmon fishing. The Royal Burgh of Dornoch as a cathedral town and the county capitol as well as having one of the top 10 golf courses in the world. It also has silver sands that stretch for miles and is an excellent base for touring the area. Brora, once a busy harbour town with the most northerly coal mine in Europe and a world renowned woollen mill, is home to the much sought after Clynelish whisky. All are also home to many hotels and apartments which host the travelling golfers who return to play the excellent courses available in these locations. The Rotary Club of East Sutherland was formed in 1989 and has a very active membership. 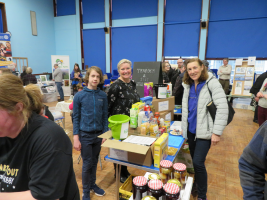 It is a busy, enthusiastic and very successful wee club which is committed to Service Above Self and to supporting all the Rotary avenues of service. Use the 'What We Do' tab to see the variety of ways we get involved in our local, national and international COMMUNITIES. 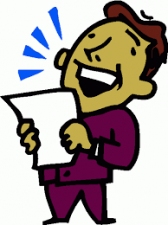 But why tell you too much, when you know we are part of the larger family of Rotary the World Over and you can visit us at 6 for 6.30 any Wednesday at our meeting venues shown at the bottom of this page. Visit us soon in real time and in a real place not just on these virtual pages. Dornoch. Speaker Ramsay Aitken - Youth Work & DOE Awards. Raffle B Christie Door J McMurray. Dornoch. Speaker Tony Gill. (Council meeting 1945). Golspie. Speaker Brora Rangers Ladies & Youth Initiative. (Mini business meeting). 1st and 3rd Wednesdays Golspie Inn, Golspie, KW10 6RS Tel: 01408 633234. enquiries@golspieinn.co.uk 2nd and 4th Wednesdays at Royal Dornoch Golf Club IV25 3LW Tel: 01862 810219. neil@royaldornoch.com 5th Wed we explore!